I use my own cables so everything else in the box is untouched. I also include a 1 year warranty for peace of mind. Over 200 hot titles, including but not limited to. Justice League Task Force. 6 Kirby Super Star. Nintendo Classic Mini Console. Pre-loaded with Classic Games. Condition is Used but excellent condition. This was bought as a Xmas gift in 2018 but has been hardly used due to not having time available to play on it- hence the sale. Everything you need to get up and running is here, including UK plug in smaller box. All items pictured are genuine Nintendo. Everything has been packed back into original box with original wrapping as pictured. 20 classic Super Nintendo games available. Really enjoyable gaming for kids and adults alike. Thanks for looking. Super Nintendo SNES Mini Console - NEW & UNOPENED. Condition is New. Dispatched with Royal Mail 2nd Class. Only used a couple of times, as new condition in original box and wrapping. Super Nintendo Classic Mini Console. Nintendo Mini SNES Super NES Classic Console w/ Pre-Installed Games - Boxed . Used twice so in great condition. Official EU SNES Mini Classic Console Controller Extenders Official UK Nintendo USB Plug. Condition is Brand New, unused and not modified. Dispatched with Royal Mail 1st Class. All items are in original boxes/packaging. I received this for Christmas and played it once on the day. Unfortunately I don’t have time to play it. It is still boxed with all packaging. Nintendo Classic Mini White Console. Dispatched with Royal Mail 2nd Class. CAN TAKE £95 ON COLLECTION IF YOU WISH. SUPER NINTENDO CLASSIC UK EDITION MINI SNES NEW! Kirby Super Star. Super Mario World. Super Castlevania IV. Super Ghouls 'n Ghosts. Super Mario Kart. Super Mario RPG: Legend of the Seven Stars. Super Punch-Out! Snes mini, brand new in box. Up for grabs is a Nintendo (SNES) classic mini. All boxed, virtually new! Played on once! The photo's say it all! It is factory reset, all boxed as new and ready for dispatch! New Nintendo SNES mini classic with 213 extra games - Fast dispatch& delivery! 4.5 out of 5 stars - New Nintendo SNES mini classic with 213 extra games - Fast dispatch& delivery! 71 product ratings71 product ratings - New Nintendo SNES mini classic with 213 extra games - Fast dispatch& delivery! 380+ Games! SNES Mini Classic ConsoIe Nintendo GET IT QUICK! Nintendo Classic Mini Dig & Spike Volleyball. Super Smash TV. A.S.P. - Air Strike Patrol. Adventures of Yogi Bear. Tetris Attack. Hit the Ice - VHL - The Official Video Hockey League. Strike Gunner S.T.G. 4.5 out of 5 stars - 380+ Games! SNES Mini Classic ConsoIe Nintendo GET IT QUICK! 71 product ratings71 product ratings - 380+ Games! SNES Mini Classic ConsoIe Nintendo GET IT QUICK! Brand new SNES CLASSIC Mini which is boxed. Free delivery. Happy buying and thanks for looking. 1 x Mini Snes console. • Super Castlevania IV™Super Ghouls ’n Ghosts®. • Kirby™ Super Star. • Super Mario Kart™. • Super Mario RPG: Legend of the Seven Stars™. • Super Mario World™. • Super Punch-Out! In hand and ready to dispatch. Nintendo Classic Mini Console - like new, only been used a handful of times (see photos.) 30 pre-installed classic games ready to play as soon as the console arrives. Includes the power supply cable, an official Nintendo HDMI cable and a NES controller too. Please note the box may show small signs of wear. Dispatched with first class delivery. Happy bidding! (Nintendo SNES). Super Mario World. Super Ghouls n Ghosts. Super Mario World 2 Yoshi's Island. Super Mario Kart. Super Mario RPG Legend of the Seven Stars. Super Punch-Out. Collection available in person from Rushden, Northamptonshire, about 6 minutes way from A45 and/or A6, NN10 area. SNES Classic Edition console. Manual Book. Micro-USB Power cable. Given 2 as presents so selling one. OFFICIAL SUPER NINTENDO CLASSIC SNES MINI CONSOLE FOR SALE - NEW. Condition Guide. Item has only been opened once to check everything is in box. This version is smaller and quicker then the old PAL version. - 16bit Gaming. You can just plug them in and play! Why buy used, when you can buy new. This set includes To use this device you will also require a UBS Mains Adapter: SV/1A Output AC Adapter with a USB Port. Brand new snes mini classic. · Super Mario RPG: Legend of the Seven Stars™. · Kirby™ Super Star. · Star Fox™. · Star Fox™ 2. · Super Mario Kart™. · Super Castlevania IV™Super Ghouls ’n Ghosts®. · Kirby Super Star. · Super Castlevania IV. · Super Ghouls ’n Ghosts. · Super Mario Kart. · Super Mario RPG: Legend of the Seven Stars. · Super Mario World. · Super Punch-Out! Brand new sealed in box - totally in opened, 2 for sale. 21 games pre installed, all the SNES favourites: Super Mario World Mario Kart Street fighter I can post pretty much next day once payment has cleared. Brand new Nintendo SNES Classic Mini, UK model, box not opened. Brand new in box, never opened and not switched on. UK only please. Please note that this item is strictly 'sold as seen'. No returns, so please make sure that the item is exactly what you need. If you have any questions or need additional photos, please ask. Micro USB cable and FREE Plug. 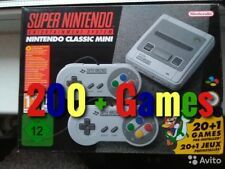 New Nintendo SNES mini classic with 200+ extra games! UK SELLER FAST DISPATCH! Nostalgia for the golden era of gaming has been growing over recent years, and many gamers have been actively seeking out consoles of the past. Nintendo released the Classic Mini Console in reaction to this, making it easier for fans to take a trip down lane back into a time where video games could offer simplicity. Keen gamers will easily find an affordable Classic Mini Console from Super Nintendo on eBay. What games are available for the Super Nintendo Classic Mini Console? Star Fox 2: This was previously unreleased. The Legend of Zelda - A Link to the Past. Does the Super Nintendo Classic Mini Console come with controllers? Yes, the console comes with 2 controllers, which replicate those of the original model. They are wired and ready to go. It is also worth noting that the Wii Classic Controller is compatible with the Classic Mini Console. Is the Super Nintendo Classic Mini Console compatible with an HD TV? 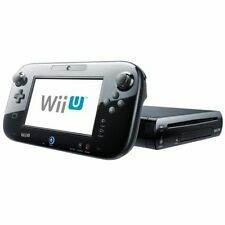 Although the Mini Console hearkens back to the nostalgia of the original Nintendo, it can be connected to a HD TV. An HDMI cable is included with brand new models, allowing you to enjoy your favourite games in a higher resolution. Remember to check the manufacturer’s site for details on additional cables. There are some new features, designed to excite the game and to enable the player to customise their gaming experience. It’s now possible for players to rewind up to 5 minutes of game play. There is a new frame feature, which enables players to create a border around their game. 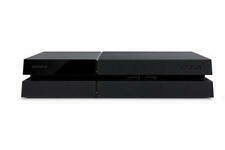 The practical size of this console is also new. It is now small enough to fit discretely underneath the TV.